Rugs and Carpet Are the Same, Right? 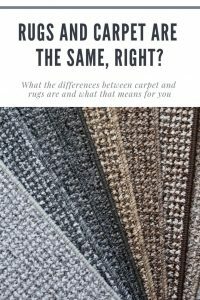 Most people seem to think that because they are similar, area rugs and carpets are exactly the same, and thus you can treat them exactly the same. After all, isn’t a rug just a loose piece of carpet? The most obvious difference between an area rug and carpet is how they are made. Area rugs are made to be picked up and moved, while carpets are often permanent installations. For this reason, the backing, sticking and other aspects of the rug are different compared to wall-to-wall carpet. In addition, each separate rug may vary depending on where they were made, what material and the ideal use of the rug. For these reasons, they all require slightly different care. Carpets are often wall-to-wall or the ends are covered with trim so they aren’t visible. Area rugs, on the other hand, have many different types of finishing. Finishing can be delicate and need to handled with care to keep the rug in good shape. A common type of rug finishing is fringe, which is particularly delicate and easily damaged by vacuumed and other carpet cleaning machines. Area rugs with fringe need to be treated more carefully than carpets do. Depending on the cleaning process used, bleeding dye can be an issue. This isn’t as big of a problem in carpets, which are often a single color. However, area rugs usually have multiple colors and patterns. If the colors on an area rug were to bleed, it would ruin the design and the rug. This is why it is incredibly important to use the correct solutions and methods to clean an area rug in order to prevent bleeding and fading from happening. Often, a standard carpet cleaning solution just won’t cut it for a rug. Another concern with area rug dye that isn’t a concern with carpets is a process called antiquing. This is a process that is done in order to make a rug look older and more expensive. Antiquing is common in some types of area rugs but rarely seen in carpets. The antiquing layer can wash away with some forms of carpet cleaning, so it’s important to treat antiqued rugs differently and more carefully than carpets. Most area rugs are made to be thicker than carpets with a dense pile construction, which means they have more carpet fibers closer together. The dense pile tends to trap dirt and other contaminants in the rug. While a vacuum cleaner can handle most carpet piles, depending on the thickness of the rug a standard vacuum may be unable to remove the trapped soil. This is why people sometimes take their rugs outside and shake or beat the dirt out, which isn’t possible with a standard carpet. All of these differences mean that carpets and rugs require different cleaning methods. Both your carpet and your area rugs should be cleaned by a professional regularly. Carpet has to be cleaned in-home by a carpet cleaning professional as it cannot be picked up and moved to a cleaning facility. Area rugs, on the other hand, have different cleaning options. They can be cleaned in-home or at a facility, depending on the needs of your rug. When looking for a professional rug cleaner, look for a company that is trained to work with many different types of rugs and offers a specific rug cleaning instead of just a generic carpet cleaning service. John’s Chem-Dry of Whatcom County is happy to help you with all of your rug and carpet cleaning needs in and around Bellingham.